Remember all the thousands of aliens you've been killing over the years? Well, they're back and they intend to make Duke pay for his crimes. Haunted Nukem is a 5-map minimod that has the outward appearance of Blood. 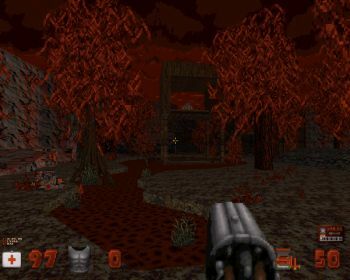 All five maps share a "haunted" theme, but gameplay is very much straightforward vanilla action involving key cards and tons of dead aliens, leaving no time for jump scares or anything particularly new. 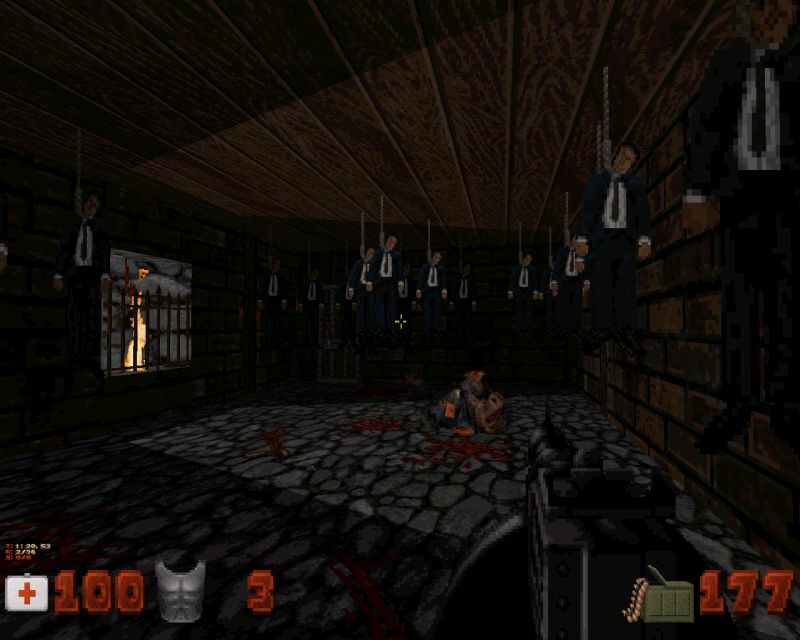 If you've played Blood, you know pretty much what kind of environments and gameplay to expect. There are a few eye-catching details every now and then, and overall the pack's map design is solid. 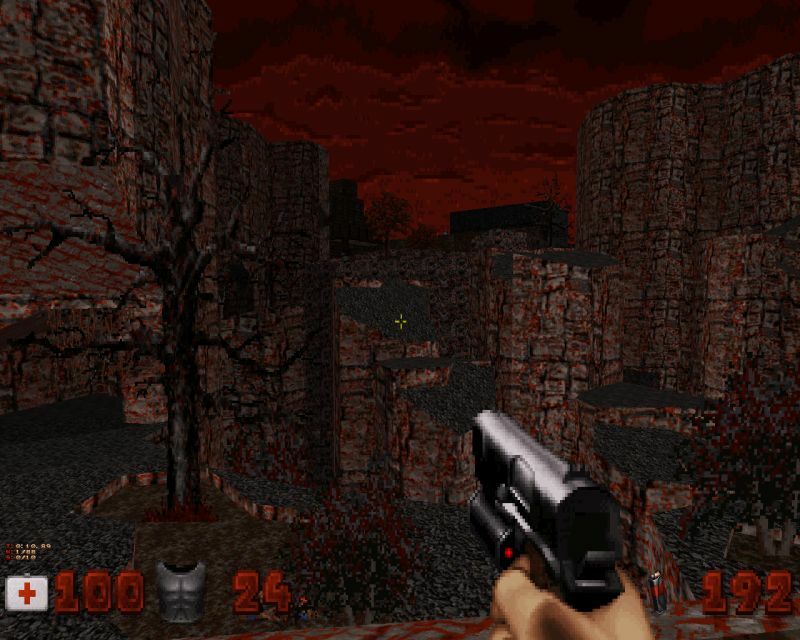 Duke64Nukem is at his best crafting outdoor areas, be they thick in vegetation or just barren canyons, while his co-author st1llwanted excels in narrower environments that emphasize factors such as lighting and detailing. There are plenty of borrowed assets such as textures and sounds from other games, mostly Blood. 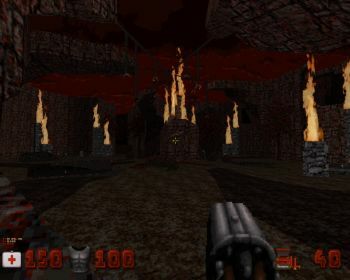 While you'll be dealing with stock Duke3D enemies, some weapons have been slightly modified: The shotgun, borrowing its functionality from Blood, is a bit weaker now but shoots two shots in quick succession, and the former chaingun cannon is more powerful now, capable of mowing down large groups in just a few seconds. The chaingun is quite satisfying but the shotgun takes some time to get used to because it reloads after every two shots, which makes timing an issue when facing monsters such as Pig Cops. There's also a new hitbox system whereby careful aim is rewarded with a deadly headshot. Obviously it only works when autoaim is turned off; this is slightly problematic because of the considerable random deviation that gets added to every pistol shot, so headshots are best tried at close range. The "new" textures and sounds generally speaking blend in nicely together, and the mod seems to have an affinity for all things red. Conclusion: Haunted Nukem doesn't strive to be an innovative horror episode, but instead seems comfortable in providing oldschool Duke3D action in haunted, Blood-like environments. In that it succees, providing 30-60 minutes' worth of entertainment. Not a bad way to celebrate your Halloween.